It is the ratio of force per unit area required to penetrate a soil mass with standard circular piston at the rate of 1.25 mm/min. 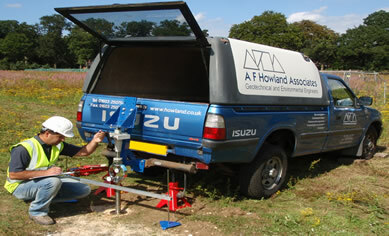 to that required for the corresponding penetration of a standard material. 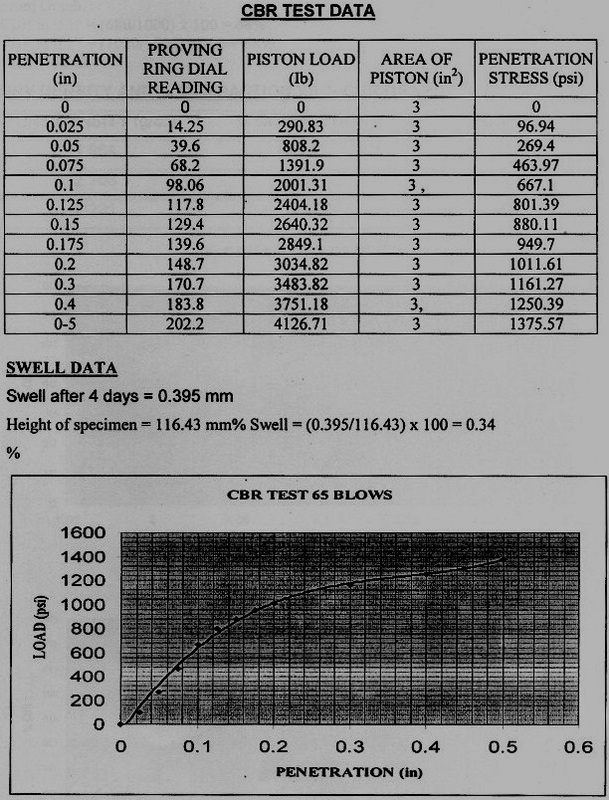 The California Bearing Ratio Test (CBR Test) is a penetration test developed by California State Highway Department (U.S.A.) for evaluating the bearing capacity of subgrade soil for design of flexible pavement. Tests are carried out on natural or compacted soils in water soaked or un-soaked conditions and the results so obtained are compared with the curves of standard test to have an idea of the soil strength of the subgrade soil. Normally 3 specimens each of about 7 kg must be compacted so that their compacted densities range from 95% to 100% generally with 10, 30 and 65 blows. After compaction, remove the collar and level the surface. Take sample for determination of moisture content. Weight of mould + compacted specimen. Place the mold in the soaking tank for four days (ignore this step in case of unsoaked CBR. Take other samples and apply different blows and repeat the whole process. After four days, measure the swell reading and find %age swell. Remove the mould from the tank and allow water to drain. Then place the specimen under the penetration piston and place surcharge load of 10lb. Apply the load and note the penetration load values. 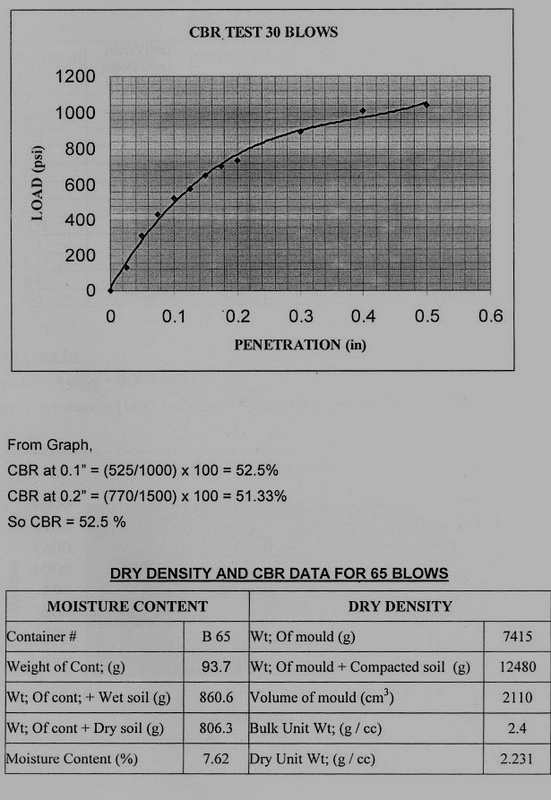 Draw the graphs between the penetration (in) and penetration load (in) and find the value of CBR. 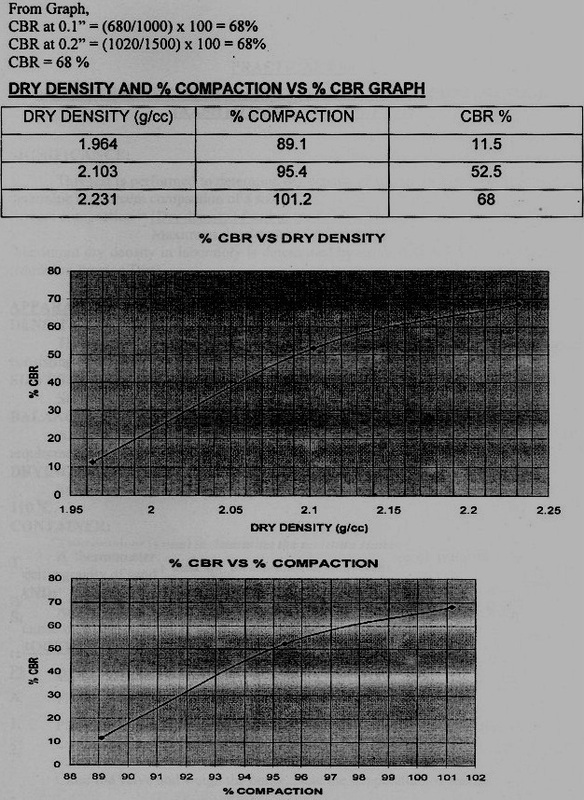 Draw the graph between the %age CBR and Dry Density, and find CBR at required degree of compaction. 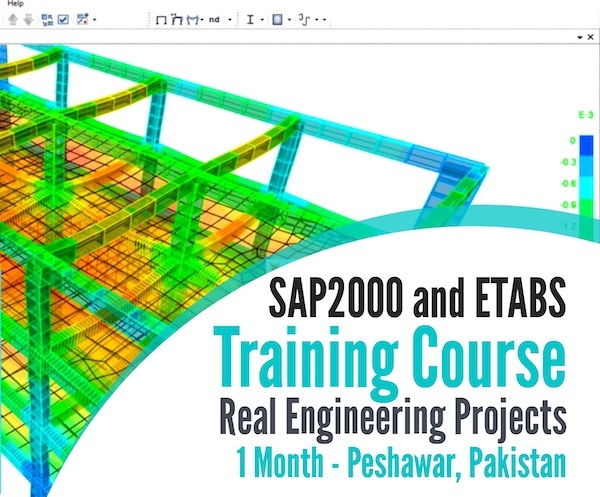 The CBR test is one of the most commonly used methods to evaluate the strength of a sub grade soil, sub base, and base course material for design of thickness for highways and airfield pavement. 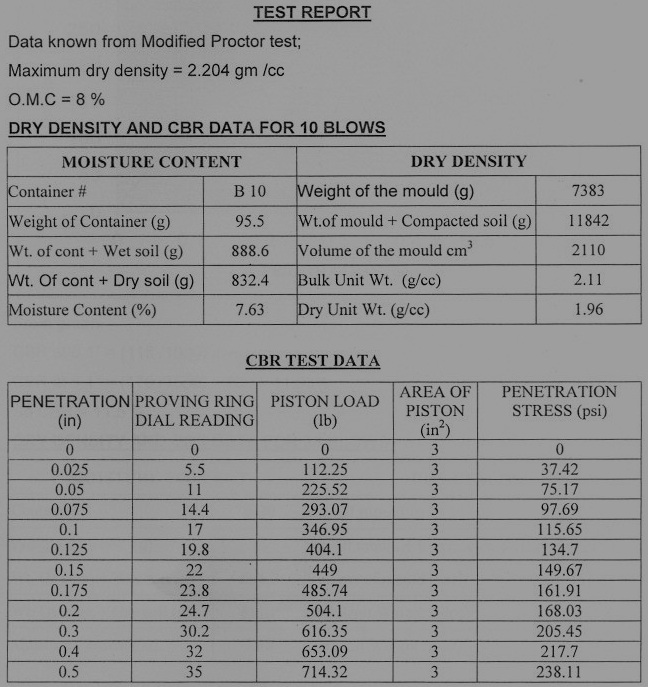 This instruction sheet covers the laboratory method for the determination of C.B.R. of undisturbed and remolded /compacted soil specimens, both in soaked as well as un-soaked state.